Born in Gorey, Co. Wexford in 1950, he studied at Bath Academy of Art; Trinity College, Dublin and at the Accademia di Brera in Milan, 1971 – 1975. He is perhaps best known for his large-scale, site-responsive sculptures inwood. These abstract constructions typically maintain a sense of lightness despite their size and mass. 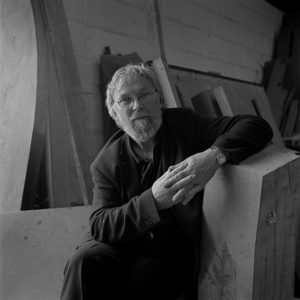 His major public commissions in Ireland include sculptures made for RTÉ, Dublin Port Authority, Trinity College Dublin, the Irish Museum of Modern Art, and the Civic Offices on Wood Quay, Dublin. In 2002, he completed a major installation in corten steel for East Point Business Park in Dublin. Internationally, his sculpture can be seen in Jeddah, Saudi Arabia; at the Olympic Sculpture Park, Seoul, South Korea; and in Japan, Andorra, France, Spain, Portugal, Ecuador, the U.S.A. and the French West Indies. Recent solo shows include the Crawford Municipal Art Gallery, Cork (2002), the Fenderesky Gallery, Belfast (1998), Douglas Hyde Gallery, Dublin (1996), Galerie Weiller, Paris (1996), Galerie Der Spiegel, Cologne (1996). He won the Alice Berger Hammerschlag scholarship and a Macaulay fellowship in 1978, the Mont Kavanagh Award for Environmental Art in 1980 and 1983, the Utsukushi-ga-hara Open Air Museum Award in Japan in 1989, the Medalla al Merito Artistico in Madrid in 1991, while in 2001, Tulach a’ tSolais, a collaborative project with architect, Ronnie Tallon, was nominated for the Mies van der Rohe Architecture Prize.